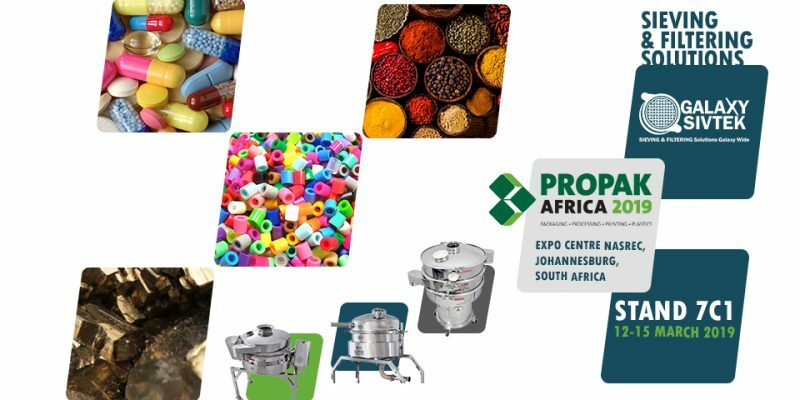 Propak Africa is the most successful exhibition in the African continent and the rest of the world. It gathers around 600+ exhibitors to cater the Food packaging, Food processing, printing & plastic industry. it is the best platform to meet industry leaders from the food industry and to learn new technologies in the market. Galaxy Sivtek is participating in Propak Africa 2019 at Expo Centre Nasrec, Johannesburg, South Africa from 12th to 15th March. Come visit us at the stall: 7C1 to solve your sieving and filtering related queries in your processing line. Galaxy Sivtek is the largest manufacturer of high tech Sieving and filtration equipment which provides you high throughput & high efficiency screening solutions. Galaxy Sivtek is providing its solution to more than 12+ industries which include Food, FMCG, plastic, Pharma, Minerals & metals and many more. We have assisted more than 1200+ brands to deliver quality products and cater them with 24X7 SIVTEK Support. Galaxy Sivtek will be showcasing a variety of vibro sifters and filters at the stage to give you a live experience of the machine so that you can feel the quality of the SIVTEK Sieving and Filtering equipments. We are ready to assist on your current sieving situation even If you have the vibrating screen or not. If you already own a vibro sifter we can assist on that too to eliminate the sieving obstacles. Client satisfaction is our prime motto! Our main objective it to solve the customers exhisting problem on sieving and filteration. there are some client who are using other make machines but we do not suggest them to replace it, we suggest them to enhance it with SIVTEK Solutions. "Turst is what we serve" -Milan Modi, Country Head - Export Sales | Galaxy Sivtek. Come let's join us at Propak Africa and explore the new technologies and innovations to ease your processing line. If you are actually looking to produce quality products than Galaxy Sivtek is your Sieving & Filtration partner because we are "Committed to Quality & Always Committed to you".